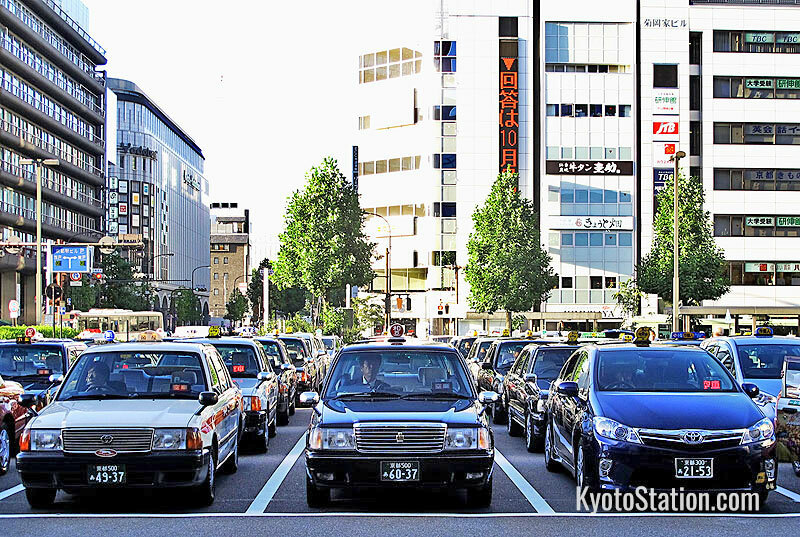 If you have missed the last train, are carrying heavy luggage, or are simply too tired to face a prolonged bus ride, a taxi ride in Kyoto can be a swift and comfortable travel alternative. Hailing a taxi can also be cost effective over short distances if there are two or more passengers to share the bill. In this article, we look at basic taxi etiquette, how to pay, where to find taxis and which taxi companies you should look out for. On most streets hailing a taxi is easy. Just raise your hand for an oncoming taxi as you would in your home country. If the light in the passenger’s side window is green, the taxi is already occupied. If the light is red, then the taxi is available. At night, a light on the roof of the taxi also indicates that the taxi is vacant. The majority of taxi drivers cannot speak English. It’s a good idea to show them a map to your destination, or to have the address written down in Japanese. The rear doors of taxi cabs open and close automatically. You don’t need to open and close them yourself, in fact it is better if you don’t. All taxi cabs have meters, and taxi drivers are generally honest, so you don’t need to worry about being cheated. There is no need to tip in Japan. You simply pay the fare shown on the meter. If you try to tip the driver, you will probably just embarrass or confuse him. Not all taxis accept credit cards, so it is best to have the appropriate amount ready to pay in cash. If you wish to pay with a credit card, you should check that your card is acceptable with the driver before the journey begins. Taxi fares differ according to the size of the taxi. There are three basic sizes small (kogata 小型), medium (chugata 中型) and large (ogata 大型). Basically taxi fares will increase with the size of the taxi. A small kogata taxi can seat four people, but if you have more people in your group you will need either a bigger vehicle or a separate taxi. 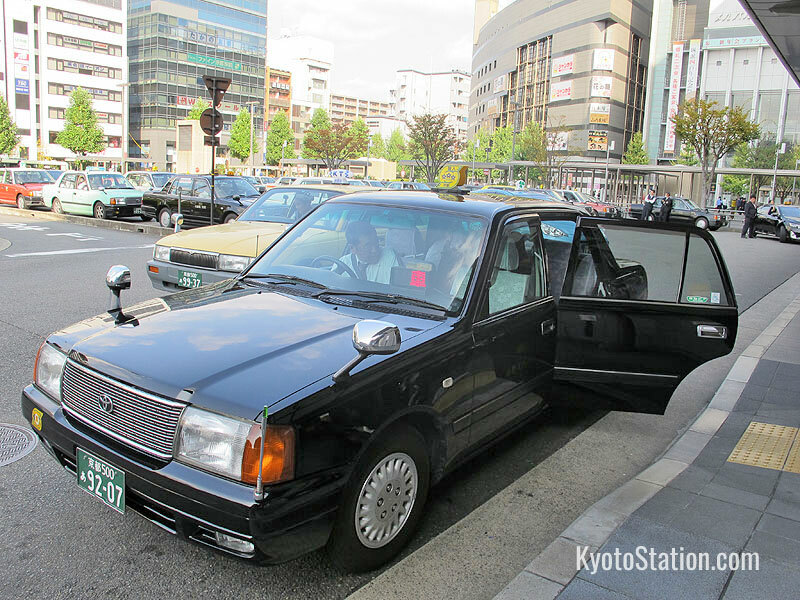 There are two taxi ranks at Kyoto Station on the north and south side of the building. You can also find taxi ranks at most other rail stations and bus terminals. At other locations it is fairly easy to hail a taxi on the street. At taxi ranks, the taxis line up and customers board them in the order they become available. For this reason, when boarding at a taxi rank, you cannot choose a particular taxi company. When hailing a taxi on the street however, you might want to pick out the better companies by their taxi logos. Not all, but some independent (個人 kojin) taxi drivers are not as polite as they should be, or drive in a careless manner, so if possible try to get a taxi from a reputable company. Of all the taxi companies in Kyoto, MK Taxi and Yasaka Taxi have the best reputation for service. These two companies also have English websites. However, as a rule if you wish to book a taxi by phone, you will need to do so in Japanese, or have someone do it for you. Below we introduce these two companies and some others you might wish to look out for. MK Taxis can be recognized by the heart-shaped logo on their roof. Purely for the level of service this taxi company wins hands down. Their drivers are unfailingly polite and well-groomed, and will often step out of the car to open and close the taxi doors for you. Some MK taxi drivers can speak English too. MK taxis are also renowned for having the cheapest service. The basic fare for a small sized taxi (seats 4) is 600 yen for the first 2 kilometers and then an additional 80 yen every 415 meters. This compares favorably with other taxis that charge 590 yen for just the first 1.7 kilometers followed by an additional 80 yen every 324 meters. MK taxis also have a special 10% discount service for customers who dress up in a kimono. In common with most taxi companies however, they do charge a 20% surcharge for taxis taken between 23:00 and 5:00 am. Yasaka Taxis can be recognized by the green clover logo on their roof. They charge regular fares and give reliably good service. Some Yasaka taxi drivers can also speak English. This company also charges the regular 20% surcharge for taxis taken between 23:00 and 5:00 am. Ecolo taxis can be recognized by the tiny windmill or air turbine on their roof. The company was inspired by the Kyoto Protocol of 1997, and tries to promote ecological energy-saving practices. For example, the clean energy generated by the taxi’s roof-top air turbine can be used to charge passengers’ mobile phones. Ecolo taxis also shut off their engines when idling to reduce emissions, and improve fuel efficiency. The most stand-out practical benefit for their passengers though is their bicycle carrying service. Many Ecolo taxis are equipped with a bike rack, so they can carry a bicycle at the back of the vehicle. If you book a taxi specifically for this purpose, there is a 200 yen pick-up fee. Ecolo Taxi charges regular rates and also has a 10% discount for people over the age of 65. There is a 20% surcharge for taxis taken between 23:00 and 5:00 am. Most of their taxi drivers cannot speak English and telephone bookings should also be made in Japanese. Most taxis (including the ones above) charge a 20% surcharge between 23:00 and 5:00 am. If you wish to avoid paying that extra fee, look out for one of the following companies that do not have the surcharge. Miyako taxis can be recognized by the 都 (miyako or “capital”) character on their rooftop logo. Aoi Group taxis can be recognized by their crescent moon rooftop logo. Rakuto Group taxis can be recognized by their white elephant rooftop logo. There are a number of options if you would like to specially hire an English speaking driver whether for touring or for business. Yasaka Taxi has a Limousine Service with an English speaking driver that can be used for private sightseeing or business transportation. They can also make bookings for you for restaurants, events, or geisha entertainment. Find out more at their website or call 075-842-1214. The Rakuto Group has a set of English language taxi tours to choose from with a range of choices in both location and duration. Find out more at their website or email: info@rakuto-taxi.co.jp . MK Taxi have an English speaking chauffeur service for business transportation and a huge range of sightseeing packages. Check their website for details or call: 075-757-6212. You can also walk directly from Kyoto Station to their VIP Station and make a booking there. 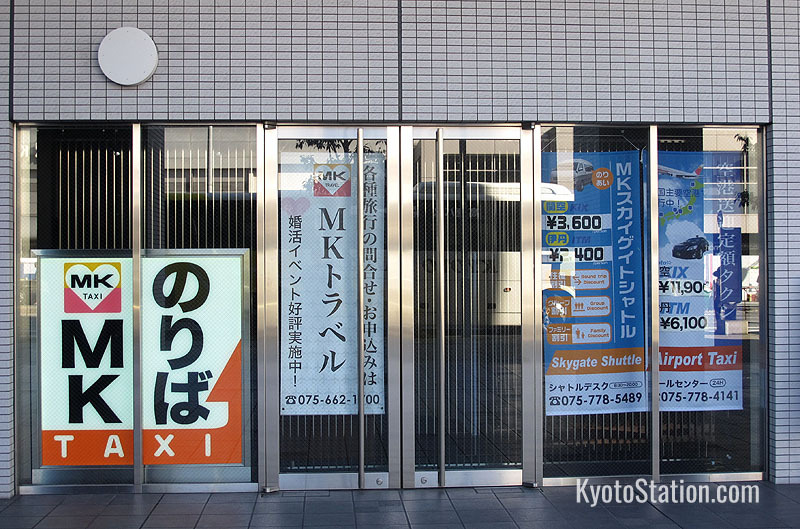 The MK VIP Station is located directly opposite the Hachijo exit of Kyoto Station’s south side, in the Ibis Styles Hotel building. Here is a map. 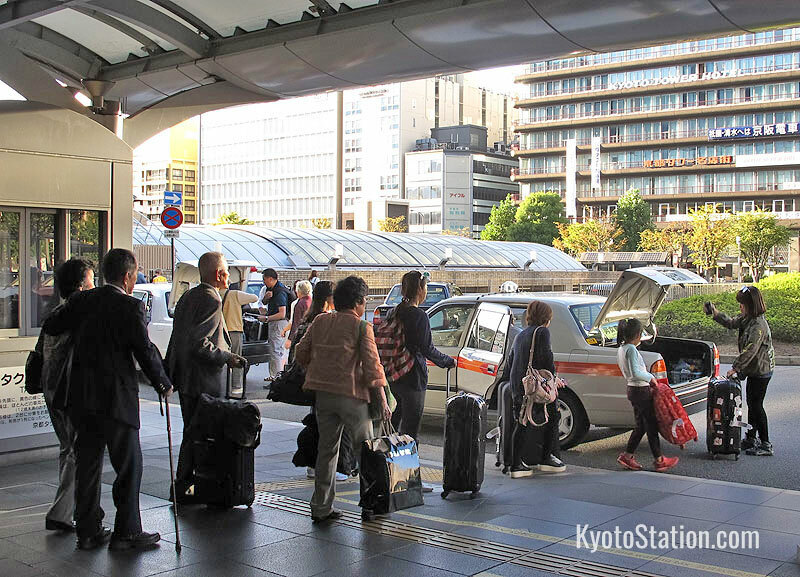 Both Yasaka Taxi and MK Taxi operate excellent door-to-door shuttle services between Kyoto and Kansai International Airport, and at comparable prices. Both companies require a reservation at least two days in advance of your trip but early bookings are advisable in case seats become unavailable. Yasaka Taxi’s shuttle service can be booked online here. MK Taxi’s shuttle service can be booked online here. Read our article, Traveling Between Kyoto and Kansai International Airport to find out more about travel options between these two destinations.